#VIXIndicator Here’s the version of the past results I posted back in May. 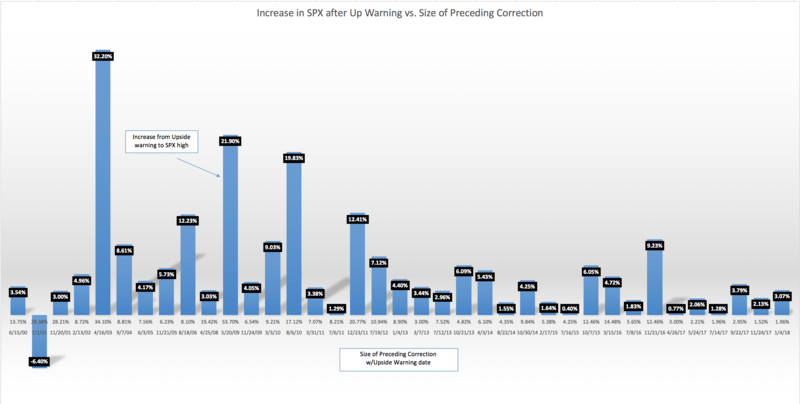 The blue bars with numbers on top represent the percentage move UP from the close of an Upside Warning day to the eventual SPX high before another pullback. The numbers at the bottom of each bar are the percentage move DOWN of the preceding correction, and the date of the Upside Warning. Please ask any questions you have! (you can click on the chart to see it full screen). As you can see, the Upside Warning is pretty reliable for at least a couple percentage points higher. Obviously we don’t know what the blue bar for this one will be, but what was the final preceding down correction? Based on a quick look, when upside warnings are far apart, the move up is bigger. It’s been 13 months since the last upside. Maybe?? Yes, this is possible. Another factor, which I have not charted yet, is how much SPX has already moved off the bottom before the UW hits. We’ve already recovered nicely from the 2300 area. Could mean there’s not a lot farther to go. True. We’ve had a big move since Dec 24.